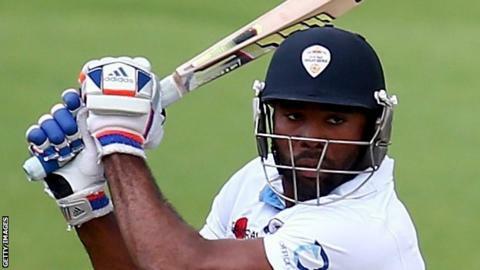 Leicestershire denied Derbyshire a final-day victory in a dramatic climax to the season at the County Ground. The hosts were well placed to get the 341 they needed to win after Chesney Hughes hit 101 and Wayne Madsen 66. But late wickets, including three in six balls in the closing stages, saw Derbyshire slump from 285-2 to 331-8. Tom Knight batted out the last five deliveries for a draw after Wes Durston (6-109) helped dismiss the visitors for a second innings' 363. Leicestershire began the morning on 307-7 before Durston's spin claimed the key wicket of skipper Mark Cosgrove for 156 as he was stumped by Niall O'Brien. The Derbyshire all-rounder also accounted for Rob Taylor and Zak Chappell, while Mark Footitt finished with career-best match figures of 10-155. Derbyshire's run chase began well with an opening stand of 103 between Ben Slater (56) and Billy Godleman (51), but a loss of momentum after Hughes and Madsen fell in quick succession scuppered their chances at the death. The result leaves Leicestershire well adrift at the bottom of the final 2015 Division Two table, with Derbyshire one place higher in eighth.